Back in December, I reported that NASA had lost a solar sail in space. Good news: they found it again! 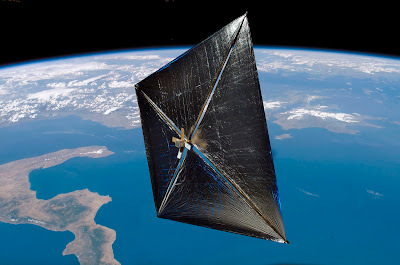 The solar sail started out tightly bundled inside a tiny satellite called NanoSail-D. Actually, NanoSail-D is a "nanosatellite," and it was launched inside a "microsatellite" called FASTSAT. At the beginning of December, like a parade of nesting dolls (or iPod iterations), the microsatellite was supposed to eject the nanosatellite, which was then supposed to eject and unfurl its cargo: a 100-square-meter reflective sail. But when NanoSail-D failed to report back to scientists, they reluctantly admitted that something had gone wrong. Maybe the sail had tangled or the satellite had lost power. Whatever it was, they wouldn't be able to gather any data about the solar sail. This enticing technology, which might someday carry spacecraft through the sky, gathers its power from the sea of photons sent out by the sun. Science Guy and solar sail researcher Bill Nye congratulated the NanoSail-D team on the good news. But congratulations are also due to the ham radio club members who first heard the satellite beeping away up there.